Handcrafted of natural cedar. Capacity: 20 bats. Attract a famiy of bats to your yard. Naturally rid garden of mosquitoes and other insects - no pesticides or toxic sprays needed. Cedar house comes fully assembled, ready to hang. Room for up to 20 bats. Meets guidelines from Bat Conservation International. Proudly made in the USA by Amish craftsmen. 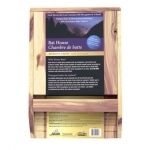 The deluxe bat castle is a large capacity cedar bat house with an attractive chalet roof. The grooved front and inside panels provide excellent footing for the bats, and can house from 30 to 50 bats. Proudly made in the USA by Amish craftsmen. Handcrafted of natural cedar. 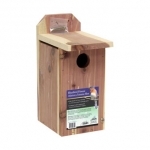 This Bluebird House features a predator guard, easy open front for cleaning, proper ventilation and drainage. 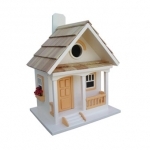 Features 3/4 inch native white unstained pine, with predator guard, easy open for cleaning. Has proper ventilation and drainageholes. Pole mount for stability. Size is 15 inch high x 5.5 inch wide x 6 inch deep. Made of over 90% recycled plastics. Our recycled plastic doesn&#39;t absorb water so it won&#39;t harbor mold or bacteria. 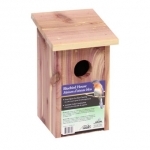 Has a 1-9/16 inch round hole which is ideal for Bluebirds. Our most popular model now has easy front opening for cleaning. 1-1/2-inch entrance hole. Instructions for use: choose a site in open country with scattered trees. Mount the house 5-6 feet above the ground on a pole, and ensure that the entrance hole does not face the direction of storms. Spacing the houses 200 feet apart will prevent any territorial conflict. Proudly made in the USA by Amish craftsmen. Side tilts open for inspection and cleaning. 1-1/2-inch entrance hole. Instructions for use: choose a site in open country with scattered trees. Mount the house 5-6 feet above the ground on a pole, and ensure that the entrance hole does not face the direction of storms. Spacing the houses 200 feet apart will prevent any territorial conflict. Proudly made in the USA by Amish craftsmen. 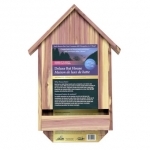 Handcrafted from natural cedar, this birdhouse allows bluebirds and swallows to make a home in your backyard. Easy snap assembly, in 15 minutes or less. Two tier, twelve compartments. Easy access for cleaning. UV coated for protection from the elements. Made from polypropylene. 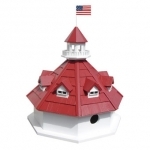 Our Annapolis Lighthouse Birdhouse is based on the historic Thomas Point Shoal Lighthouse that is located at the mouth of the Chesapeake Bay. This original design, featuring a decorative porch, pine-shingled roof, and two decorative flower boxes - one on each side. 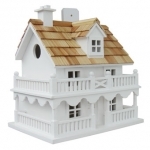 The Country Cottage Birdhouse in White will remind you of a lakeside vacation home. Constructed of exterior grade ply-board, pine roof shingles and poly resin for detail and decorations. The swing-up mounting peg makes installation a snap. With a 1 1/4in. opening, removable back wall, drainage, ventilation and an unpainted interior, there&#39;s no mistaking that this is a fully functional birdhouse. 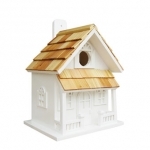 Pine shingles top this classic avian residence now available in bright white. 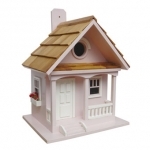 The fully, functional birdhouse features a removable back wall for easy cleaning with a 1 1/4in. side entry hole to a single, unpainted nest box plus ventilation and drainage holes. 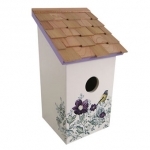 A convenient, swing-up paddle-board attached to the back allows you to hang this beautiful birdhouse anywhere. Constructed of kiln-dried hardwood. If you take the famous 17 Mile Drive North from Pebble Beach to Lighthouse Avenue, you&#39;ll soon be in the charming village of Pacific Grove, where you will find cottages just like this one. 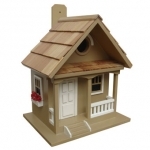 Common nesting birds such as wrens, finches and chickadees will appreciate the comforts of this functional birdhouse. A removable back wall, pine shingled roof and 1 1/4in. entry hole are just some of the features. 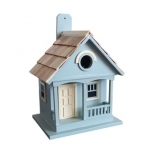 Inspired by the classic, salt box cottage found in numerous beach communities and enhanced by an anemone floral design, our Salt Box Birdhouse is an instant classic. Pre-installed key-hole hardware, drainage, ventilation and an easy-to-open cleanout give it the functionality serious birders demand. 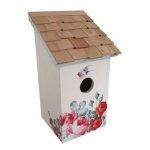 Inspired by the classic, salt box cottage found in numerous beach communities and enhanced by an peony floral design, our Salt Box Birdhouse is an instant classic. Pre-installed key-hole hardware, drainage, ventilation and an easy-to-open cleanout give it the functionality serious birders demand. 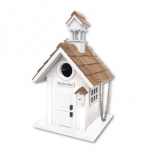 Educated birds are sure to flock to this house of learning! Architectural details include black and pine shingled roofs, a bell tower with a shiny, golden bell, multi-paneled windows front and back plus a matching birdhouse detail above the front door. 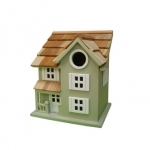 These houses are the real deal with drainage, ventilation, unpainted interiors and 1 1/4in. entry hole. Hang them on their sturdy brass chains and don&#39;t forget to unscrew the back panels for easy annual cleaning. 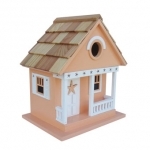 Straight from our Beachcomber Collection of whimsical, fully functional birdhouses, the Starfish Cottage Birdhouse in beige features a five-armed starfish motif with in. A tiny front porch, window and door details and a pine-shingled roof give this style its character. A removable back wall, drainage, ventilation, an unpainted interior and a 1 1/4in. hole size will invite nesting birds in and keep larger ones out. House can be hung with mounting peg (included). 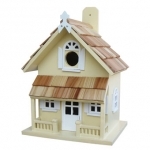 A pine shingled roof, a covered porch and Cottage styling give this fully functional birdhouse plenty of charm. A removable back wall, drainage, ventilation, an unpainted interior and a 1 1/4in. hole size will invite nesting birds in and keep larger ones out. House can be hung with mounting peg (included). Going Green Wren house is made of over 90% recycled plastics. Our recycled plastic doesn't absorb water so it won't harbor mold or bacteria. Has a 1 round hole which is ideal for Wrens.